The drawing depicts a recently installed fountain complex at Irving Park, which is a few blocks from my house. Like my world globe and bowling ball paintings, it depicts a 360° field of view as seen from a single point in space, but instead of painting the view onto a sphere I have transposed the view onto a sinusoidal projection such as is often used for world maps. Clear enough? 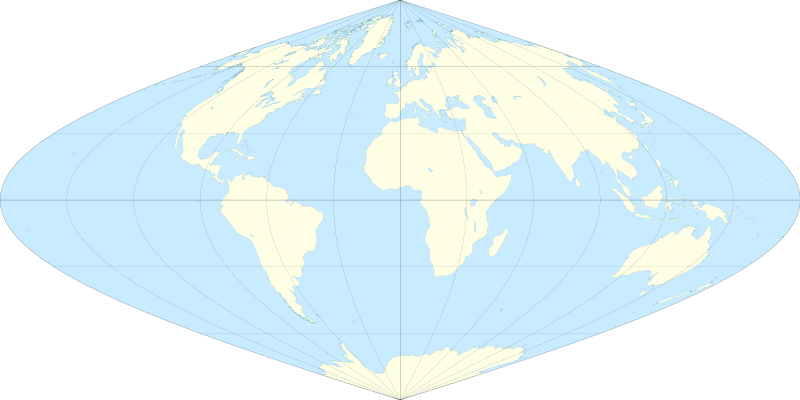 Since flat art is easier to display than spherical objects, I’ll probably be doing more of these map projection pieces. Next up: transverse mercator! Next Next post: Cartoonists On Radio!